Payroll ToolKIT is a tool designed to relieve construction and trade-related companies of the burden of payroll administration without sacrificing job costing. Whether you're presently processing your payroll in house or outsourcing it, Payroll ToolKIT provides the tools to process and manage your payroll more efficiently. You are free from the burdens of payroll processing. 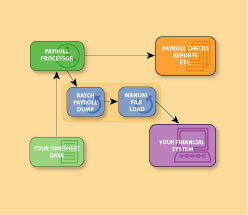 Financial data flows to the proper jobs and GL accounts as soon as the payroll is posted. Your tax and union tables are maintained and tested by experienced personnel, minimizing the chance for error. 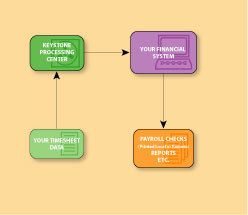 It uses the power of your existing financial software to process your payroll and produce reports. Keystone's experienced construction payroll specialists enter your timesheet data directly into your financial software from our remote processing center. By incorporating secure remote technology along with an advanced management process Payroll ToolKIT eliminates the administrative burden of payroll processing.